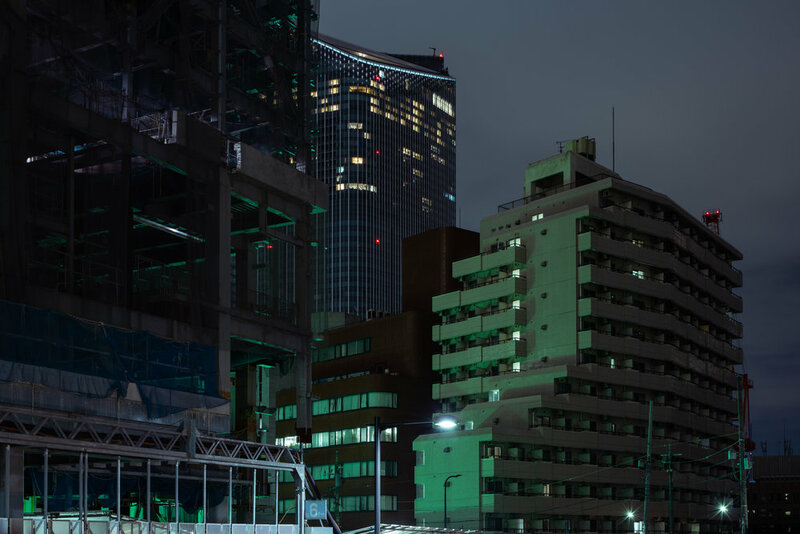 For all articles and to receive a physical copy of DERIVE Wanderer Magazine, please subscribe via Patreon. I set out from Kamiyacho Station surrounded by ultra-clean streets swept clean of the last traces of dirt. The evening was quiet, as if all the people of the city were playing hide-and-seek in the dark. Only the slow blinking of red aerial lights on the top of the monoliths gave life to the empty city. I had visited the Hotel Okura only once, some years before, but I did not stay. I remembered the dimly lit reception and the ground-floor restaurants but as I climbed the small hill leading up to the hotel I found that the main building was already gone. I searched my memories to see if I could remember what it looked like before, but all that I could find was a void. In its place stood a steel and concrete skeleton sheathed under scaffolding. I began to doubt if I had actually been there or not. Across the road the smaller South Wing of the original hotel still stood. A few lights shone dimly and the distinctive pattern of its front face was illuminated in emerald. 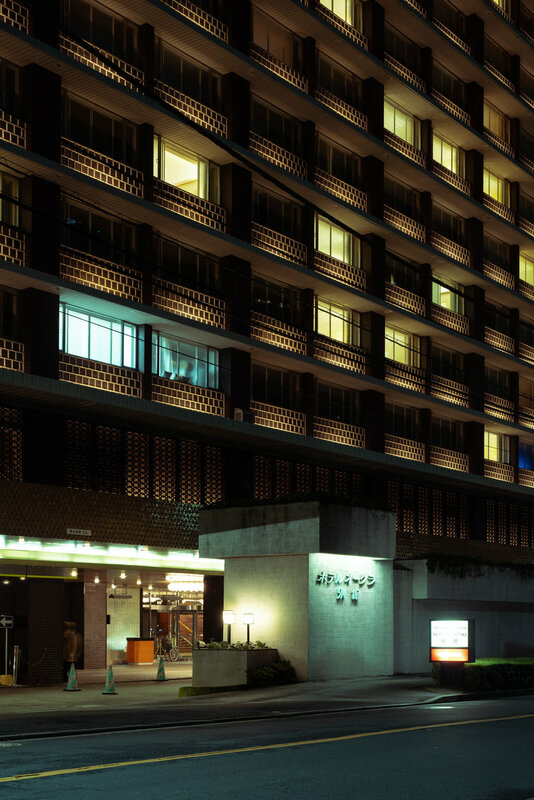 The Hotel Okura, built in 1962, defined the Tokyo Moment that I had always been looking for. 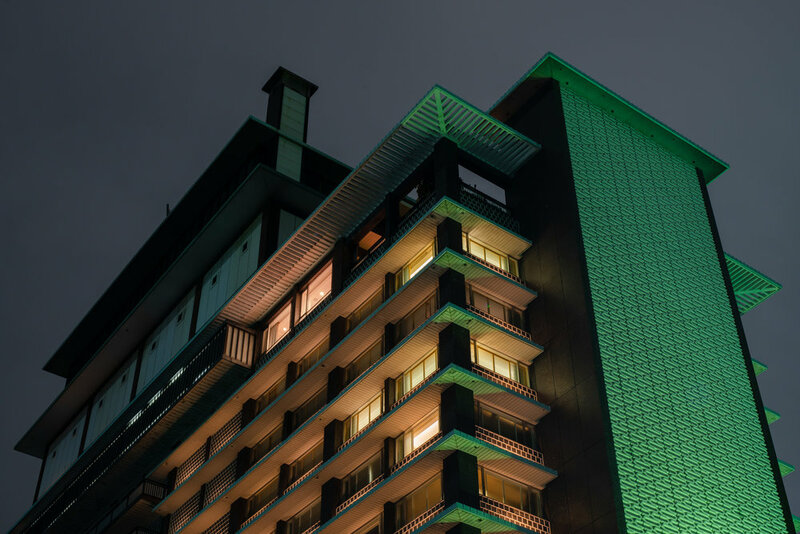 Modern chic and Tokyo nights, the Orchid Bar and forgotten memories, celluloid heroes and hushed cigarette-talk – Evenings at the Okura on the hill. Maybe I had walked its hallways, or maybe I had just read about them – either way it was not the same anymore. I stood there with my camera in the a chill of a November evening. The lights of the hotel entrance glowed in the yellow incandescence of faded memories. The Okura was over. I could only turn my back on what was left of the hotel and walk towards Roppongi and the six Zelkova trees of Runaway Horses. Outside the Audi Concept Store I met another wanderer, a visitor from New York, who was photographing the city too. 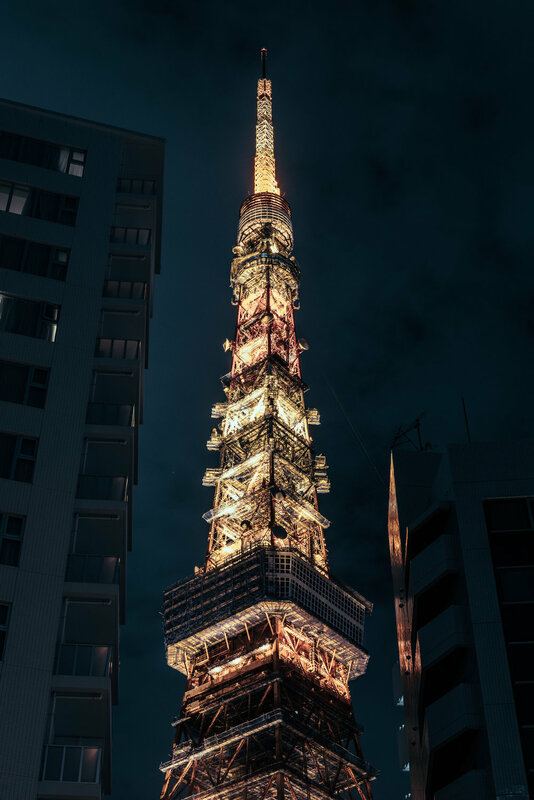 We shot for a little while, drifting towards the orange glow of Tokyo Tower and trading short stories from our lives underneath the fine evening sky.